NES Darkwing Duck (USA) "pacifist, no subweapons" in 12:35.66 by feos. The city of St. Canard is plagued by an unseen crime wave. The intelligence agency S.H.U.S.H. suspects that the shady organization F.O.W.L. and their valued operative Steelbeak are its causes. The caped superhero Darkwing has made quite some enemies in the criminal circles thanks to his past heroic deeds, and now the entire city has to pay for that. Naturally, the valiant duck is determined to travel through the dangerous streets of St. Canard, defeat his foes, and foil Steelbeak's plans. Darkwing Duck is a side-scrolling platform game featuring the titular character from the Disney television series. 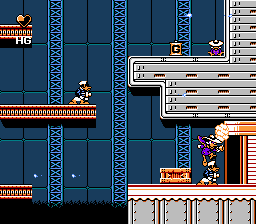 The gameplay is similar to Duck Tales, also resembling Mega Man games in many ways. Darkwing's default weapon is a gas gun; special adapters that modify its functions can be collected during exploration. By using his cape, Darkwing is able to deflect some of the enemy projectiles. Weapons can be changed via a sub-screen. For a "pacifist" type of completion, this run avoids killing enemies (they might also have dropped health refills, so health management is mandatory), and to offer maximum variety in addition to the any% version, doesn't use the subweapons (yet to save a single enemy's life, a single arrow is used). It offers some fresh action and manipulation on bosses, but can't be done entirely along with pacifist, so feos has to use a single arrow to save a single enemy's life.